Taking the time on Sundays to prepare my lunches and a few dinners for the week makes my life SO much easier. I don't *always* do this, because sometimes I'm either too busy or too lazy, but it makes all the difference when I do. I pretty much want to give myself a hug every time I pull one of my already-in-tupperware lunches out of the fridge before running out the door in the mornings or when I remember that I already have a dinner ready in the fridge that just needs to be popped in the oven. 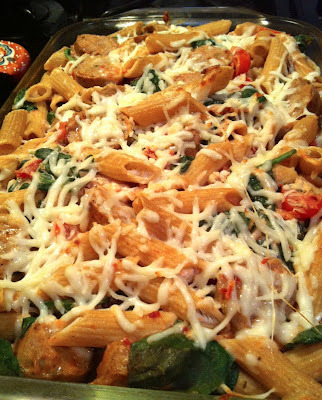 This pasta bake is one of my favorite make-ahead meals. It's easy, nutritious, and totally versatile -- I've made it many different ways, just using whatever I have in my fridge that week. It's a little heavier than some of my dinners, since it's pasta, but using whole wheat penne, balancing it out with plenty of veggies, and using a greek yogurt and tomato sauce base keeps it pretty healthy while also satisfying my carb and cheese cravings. Taking just an hour or so on Sunday to prep meals can save so much time and hassle during the week. It can REALLY save me after a 12 hour day. On Wednesdays, I am gone from about 7:30 am to 7:30 pm. Needless to say, when I get home I'm starving and exhausted, and I have no intention of standing in front of the stove and preparing a meal. If I don't have anything prepared, it's hard to avoid going down the street to the neighborhood pub (that just so happens to have 35 cent wings on Wednesdays...) where we'll eat and spend too much. So, I try to have something that's ready to go! 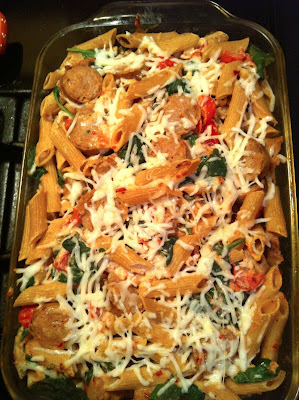 For this pasta dish, I just put it in the fridge and leave a note for my boyfriend to have it ready when I get home. Then I get to walk in to a hot and ready dinner! And this one is soo satisfying - almost as good as wings! 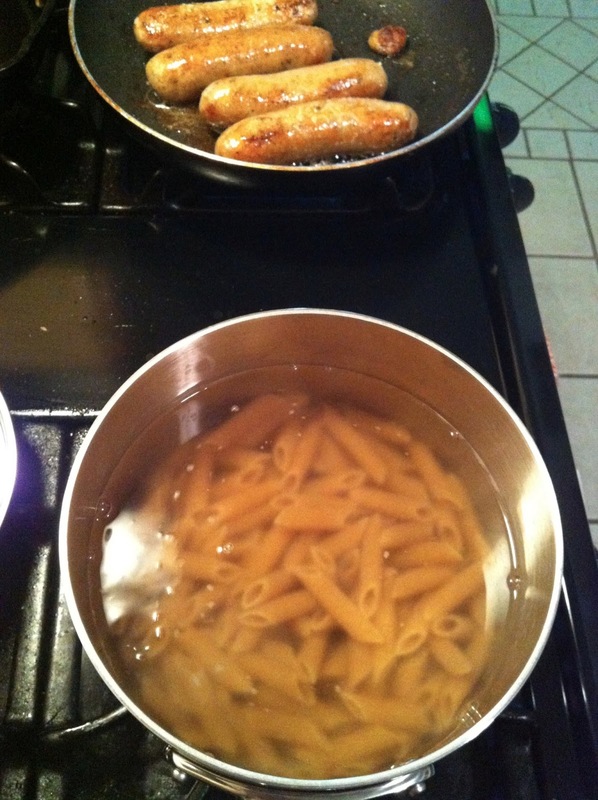 Prepare 10 ounces of whole wheat penne pasta according to pasta directions until al dente. 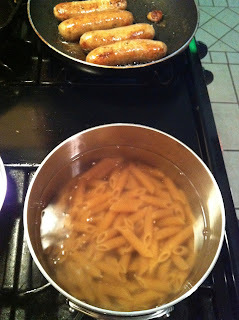 Meanwhile, cook 1 pound of spicy Italian chicken sausage in 1 tablespoon of butter for 12-14 minutes, or until browned. Right before the sausage is done, add 2 cloves minced garlic. Cook for 30 seconds longer, then turn off heat. 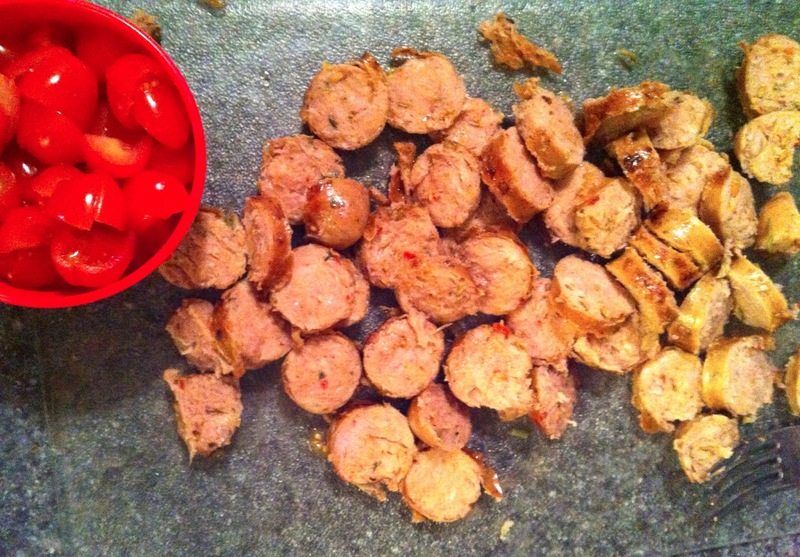 Use tongs to place the sausage on a cutting board. Pour the remaining butter and garlic into the bottom of a very large bowl. Cut the sausage into bite-sized pieces. Cut a cup of grape tomatoes into quarters. 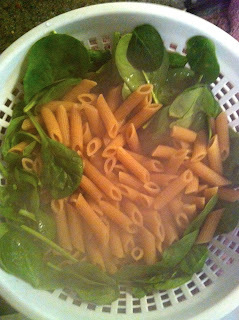 Place one bag of baby spinach in the bottom of your strainer, then drain the al dente pasta onto the spinach, letting the steam wilt it. Add the sausage, tomatoes, pasta, and spinach into the large bowl with the garlic. Add in remaining ingredients: 1 cup of prepared tomato sauce (I use Prego roasted garlic), 3/4 cup plain greek yogurt, 1 cup (less if you're not cheese-obsessed like me) shredded mozzarella, 1/4 cup milk, salt, pepper, red pepper, and garlic powder. Mix well. I could just eat this straight out of the bowl. Pour the mix into a large casserole dish. Top with another 1/4 cup shredded mozzarella. Yeah, you could definitely cut back on the cheese. But it's soooo good. Then, cover with foil and either put it in the fridge until you're ready to cook it or go ahead and pop it in the oven if you're ready to eat. I usually keep it in the fridge for a day then cook it in the next night. You could also probably freeze it if you made it several days in advance then transfer it to the fridge the day before cooking. 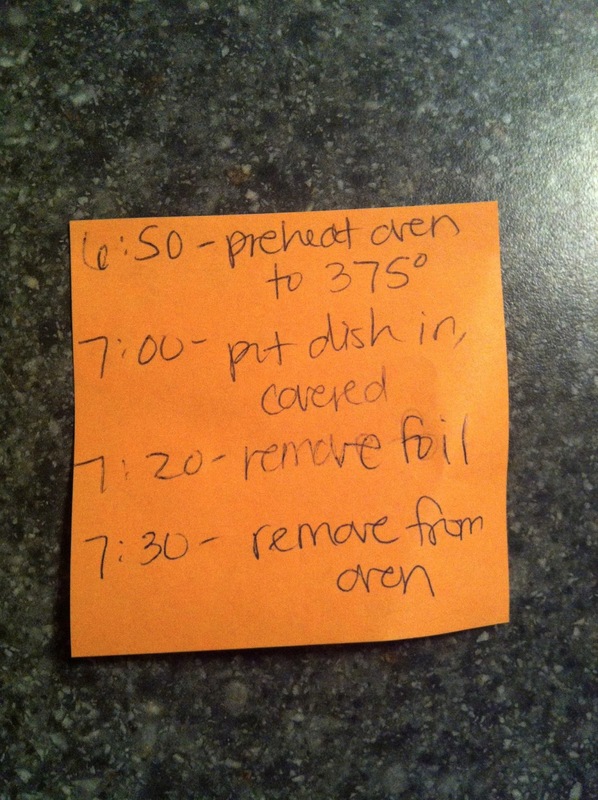 When you're ready, put it in a 375 degree oven covered for about 30 minutes. Remove foil and cook for 10 minutes longer, allowing the cheese to melt well. -Cook pasta according to package directions until al dente. -Cook chicken sausage in 1 tbsp butter over medium heat for 12-14 minutes, or until browned. When almost done, add in garlic and cook for 30 seconds more. Turn off heat and remove sausage with tongs, placing on cutting board. Slice into bite-sized pieces. Pour remaining butter and garlic into a very bowl. -Place the spinach in the bottom of your pasta strainer. When pasta is done, pour pasta and pasta water over the spinach into the strainer, allowing the spinach to wilt slightly. -Chop grape tomatoes into quarters, for a total of 1 cup. 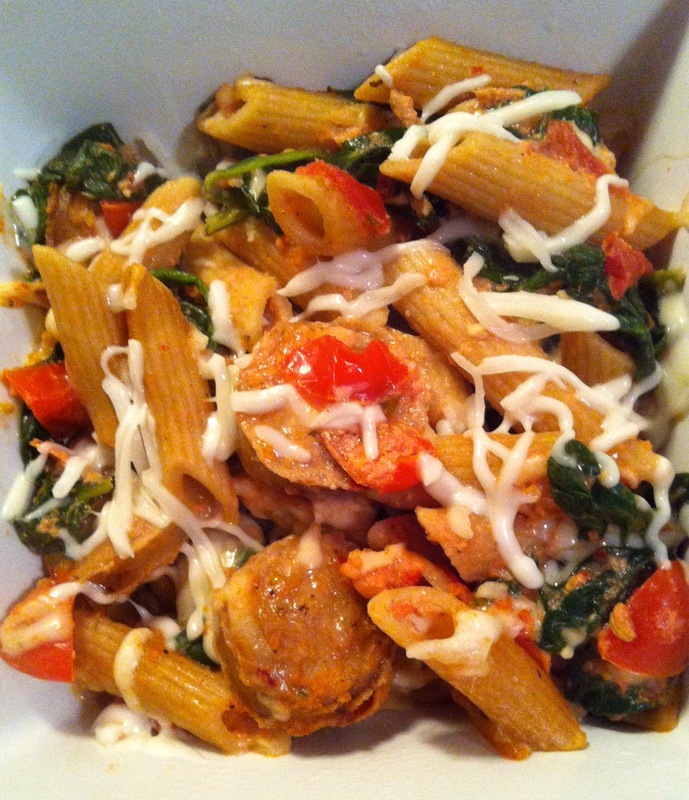 -Pour pasta, sausage, spinach, and tomatoes into bowl with garlic. -Add tomato sauce, yogurt, milk, 1 cup of the cheese, and spices to bowl. Mix very well. Pour into casserole dish. Top with remaining 1/4 cup cheese. Cover dish with foil. -Cook for 30 minutes covered. Remove foil, cook for an additional 10 minutes. P.S. In the mood for something a little different, but equally delicious? 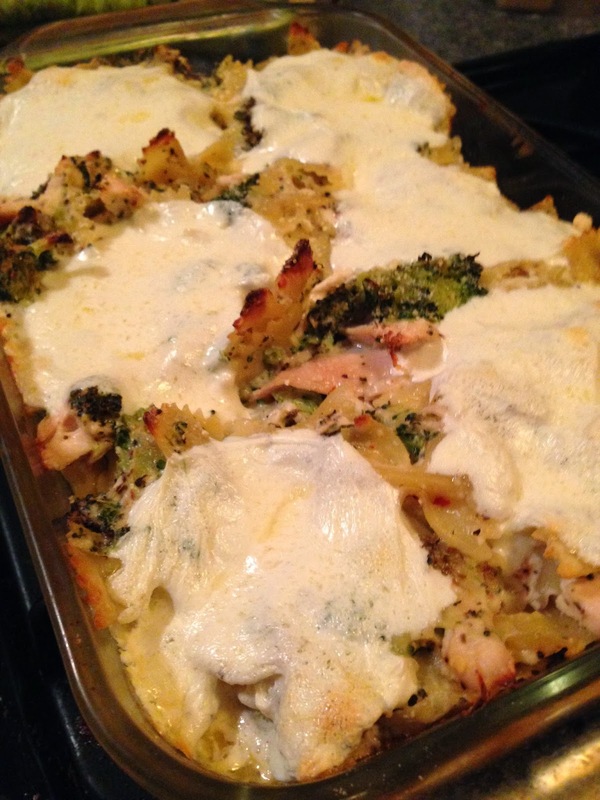 Try my lightened up chicken, roasted broccoli, and mozzarella pasta bake! oh I can't wait to make this one. This would be great for Tuesday nights which are my late night! This would be yum for leftover lunches too!!! I think I might the leftovers even more! so good. I am so glad stumbled across your blog! I love your recipes and detailed pictures - it makes things very easy for me! Thank you, Taylor! Thank you so much, Christina! :) Glad you came by. I made this the other day and my husband and I loved it! We added two different types of chicken sausage for a little added flavor. Love your blog!! thank you, Kelly, and I'm so glad you liked the dish!! just prepared this and am excited to try tonight with my father! I substituted bison meatballs for the chicken sausage...we shall see how it turns out! anyone know the calorie count? thanks! 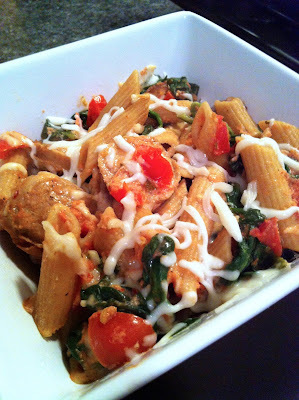 I made this for dinner tonight following the exact recipe and it was absolutely delicious! The whole family loved it and it's going to be a stable in our meal rotation from now on. I made this last night because I just so happened to have all the ingredients on hand and it was DELICIOUS. Easy to make, healthy, and enough leftovers for lunches the next day. Awesome! 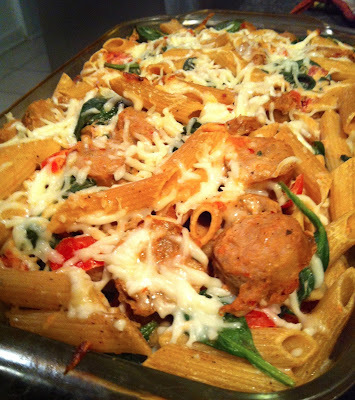 I came across this recipe after doing a search for chicken sausage on Pinterest. Made it tonight for dinner and it was amazing! Only things I did differently were to use some of the pasta water instead of milk (only have vanilla almond milk in the house) and to add some Parmesan cheese to it. So delicious! I look forward to trying some of your other recipes soon! Aja - so glad you liked it!! love the idea of subbing pasta water for milk, especially for those with dairy allergies or restrictions! This dish looks delish. What is the calorie count? I, too, would like the calorie count. Made this tonight and it turned out great. Easy and quick recipe that can be prepared ahead of time. I made this for my boyfriend and me tonight and it was so good!!! I used turkey sausage instead of chicken on accident, but still tasted great! I also added extra red pepper flakes to increase the spiciness in the recipe :) Delicious! Thanks! made this for the first time last night and it came out great! i followed it to a T - except i accidentally left out the milk. still came out great! Anyone know the calorie count for this recipe? This looks so good! I'm not a fan of yogurt (Greek or otherwise). Any idea how it would be without the yogurt? I honestly don't like Greek yogurt either but you can't even taste it in the pasta sauce. I think it's in there for the texture, which turned out wonderful. My review is below:). I am sure it would be just fine without it though, maybe just add more red sauce. This was fantastic! I used pineapple/smoked bacon chicken sausage and the balance of the spice from the red pepper flakes and mild sweetness from the pineapple was awesome. 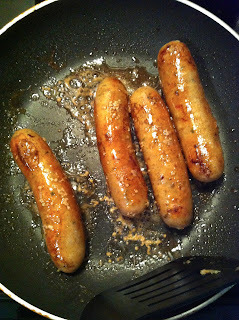 Will make this again and again, trying different types of chicken sausage along the way. Thank you!! What can I use instead of yogurt? Ricotta? I know it is not as healthy but I don't have any Greek yogurt on hand. Ricotta would work great! Or sour cream. 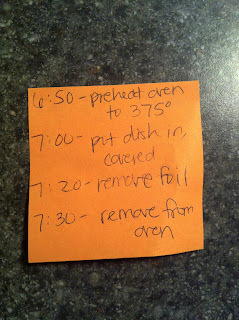 I made this today for my husband to put in the oven tonight (I will be at work by dinner time). 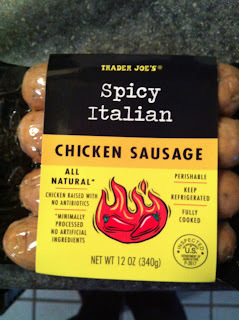 I used a mix of hot and mild italian sausage as it's really hard to find chicken sausage here (such a shame as I love it). I used the whole 10oz box of penne and a whole, big bag, of spinach. I also added a diced onion to the garlic and upped the tomato count as hubby loves tomatoes! After mixing it all together together I more than doubled the spices (except for the pepper flakes and salt) and added oregano and basil. I used less mozzarella then called for but subbed in some parmesan as it has a stronger taste and goes a little further. It will have to go in the oven tonight but so far it is absolutely delicious and it is enough to feed an army! I know what I will be making next time I have to go to a pot luck!! Thanks so much for the recipe. Has anyone made this and frozen it? DOes it work? Adjusted cooking time? Thank you!! We love this recipe. We want to bring a freezer meal to neighbors who just suffered a loss and was hoping I could use this one. I substituted the following things: almond milk, organic penne rigate, organic pasta sauce & w/ no tomoatos. So good! This has become a staple in our home! I am also a RD and share this recipe with my clients! Thank you! I made this tonight and so yummy. I added onions, zucchini and squash. It was so good.